Hungry Snakes Trap Guam In Spidery Web Forests on the island of Guam are experiencing a spider epidemic, and invasive brown tree snakes are to blame. The snakes have nearly obliterated the island's native forest birds — which used to keep spider numbers in check. 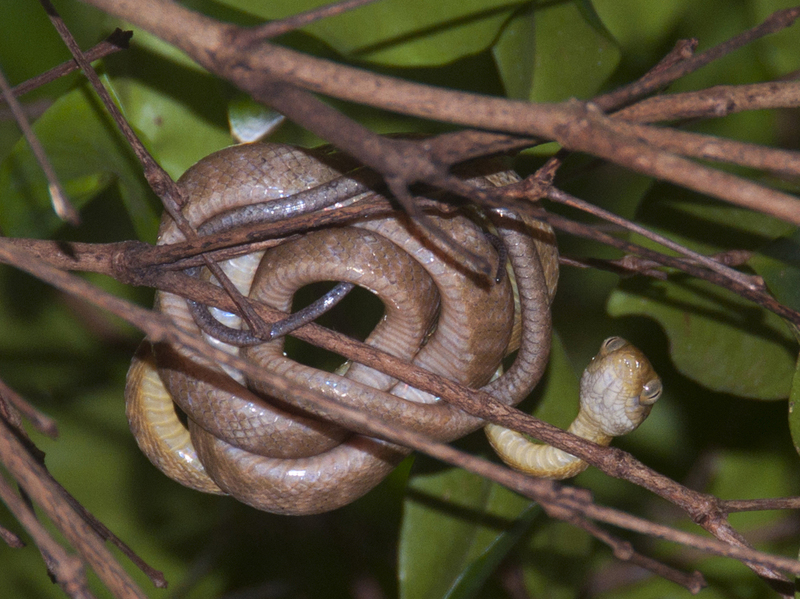 Invasive brown tree snakes have gobbled up most of Guam's native forest birds. Without these avian predators to keep their numbers in check, the island's spider population has exploded. 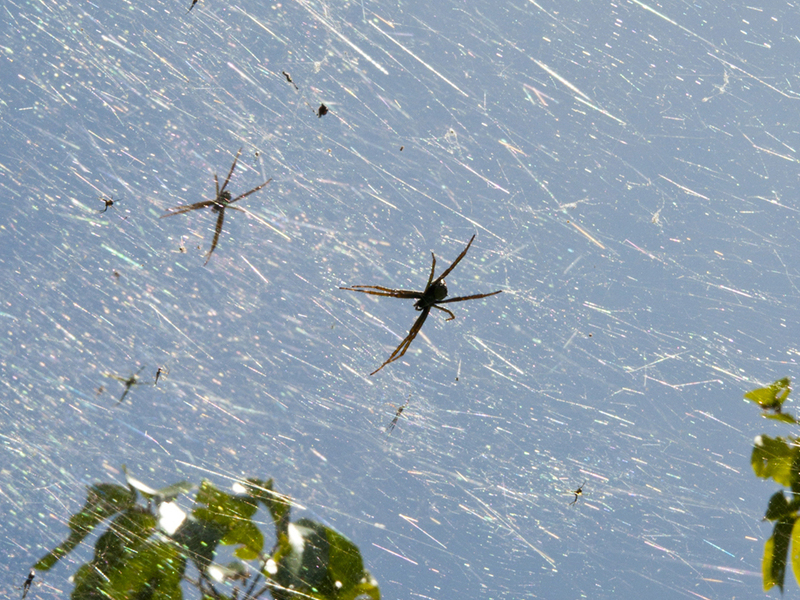 The Pacific Island of Guam is experiencing a population explosion — of spiders. There are more spiders there now than anyone can remember. To get a sense of how weird the situation is, I started out in Maryland. On my front porch, overlooking the Severn River. At 6:30 in the morning on a cool fall day, I find two spider webs in a matter of five minutes. But if I were on the island of Guam, I might find 70 or 80 spider webs in five minutes. Ecologist Haldre Rogers realized something strange was going on as she went roaming through the jungle on Guam and three nearby islands. "While I was doing that," she recalls, "it appeared that there were tons more spiders on Guam than there were on other islands." Rogers is a researcher from the University of Washington, and she was actually in Guam looking for snakes. The brown tree snake invaded Guam over 60 years ago — they sneaked in aboard boats or in the wheel wells of airplanes. And now they're everywhere: about 2 million of them. But the spider thing was just too bizarre to pass up. So Rogers started counting spider webs on the islands. In the dry season, Guam had about 2 1/2 times more spider webs. "And 40 times more webs in the wet season than on the nearby islands," she says. In the wet season, there are 40 times more spiders on Guam than there are on other nearby islands. Forty?! "Forty times, yes," she assures me. One that seemed to be everywhere was a great big yellow and black critter called Argiope appena, or the banana spider. "And actually," she says, "what we found was, their webs were much bigger on Guam than on the other islands, they were 50 percent larger on Guam." More, bigger, better ... if you're a spider. This all came about because the introduced tree snake multiplied only on Guam and ate almost all the birds. There are literally just a few hundred birds left there. Since birds eat spiders, this is good news for spiders. In fact, great news, because birds also ate some of the bugs spiders eat, so there's now more food for spiders, too. For ecologists, Guam is now a big experiment to see what happens when a top predator disappears from an ecosystem. They suspect plants could be affected too; many depend on birds to spread their seeds. But Rogers wants to remind people that Guam is still a nice place. Says Rogers: "The average person doesn't come across that many spiders, because most people don't go traipsing around in the jungle that much." If you do plan to do that, just watch where you're going.